In one of the more strange/wonderful things I can think of Steven Amell is going to be wrestling at Summer Slam this Sunday. Amell is a long time wrestling fan that had been tweeting out how much he wanted to be involved with WWE. When his dream finally came true he began a feud with Stardust. Stardust is the character played by Cody Rhodes. Rhodes is known for being a fan video games and comic books. He has come to the ring dressed as Mr. Sinister from the X-Men and even before he became Stardust he would wear a Tri-Force symbol on his boots. The impressive thing about this is Amell’s passion and the fact that he’s been training to get into the ring. Usually when a celebrity gets in the ring with a wrestler you can expect some badly thrown punches and maybe a slam of some sort. Considering how active Amell is doing stunt work on his own show it looks like this is going to be an incredibly entertaining match. To celebrate his match Amell is selling a limited time shirt. 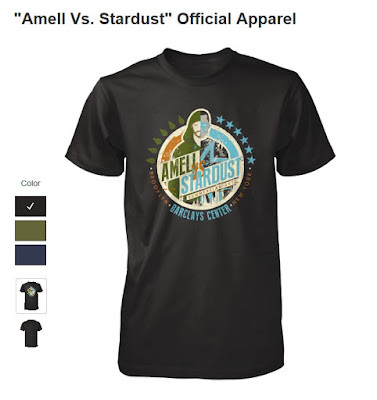 Featuring Stardust and the Arrow the shirt is pretty cool looking. Even cooler is that a portion of proceeds benefit Emily’s House, a hospice for children. You can order the shirt by clicking HERE.